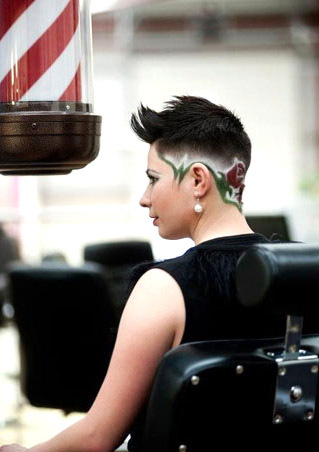 At Barberette we offer distinct hair styles, cuts, colours and shaves, specialising in sharp, sculpted shapes. Our pricing is gender-neutral: we charge on the basis of the work we do for you, not on your gender. We cover everything from quiffs to long hair, pin ups, flat-tops to cut-throat razor shaves, decorative clipper work to colouring. Most importantly, we give you the cut you want: we have no boundaries or pre-set ideas about what is best for you. We have an active role in the Hackney community, and as well as a community noticeboard, we run monthly exhibitions, charity fundraising events, clients parties and dance nights in and around London. Check our Pop Up link. Both of our shops are wheelchair accessible. Read what our clients say about us... Please check out our Terms and Conditions before booking. I grew up under mum’s hairdressing legs. I found then, that hairdressing works as a way to connect to people and how much it helps everyone to feel better and be who they are. Between 2009 and 2011, I studied at the College of North East London (CONEL) and qualified with an NVQ Level 2 in Hairdressing. The teachers were fantastic and helpful, always encouraging us to try to achieve our best. It was thanks to this positive and supportive environment that I was able to be the first in my class to graduate. During the first year of the course, I found myself a traditional hairdressing salon in Belsize park: Barbara's Hair & Beauty Clinic. Under the amazing guidance of the salon owner, Barbara, I saw and learned the real “Old School” hairdressing techniques and enjoyed sharing stories with the many different customers while their perms developed. It was a truly magical place! As his trainee, I attended some of the largest hairdresser shows and demonstrations held in the UK. It really was full on. Where else would one experience bleaching a model’s hair at 4am on a week night, to be ready for an early morning show? It was here that I learned to work with clippers and trimmers and also how to create hair patterns and designs that are popular with the alternative crowd. MK has two DVDs endorsed by the Government body HABIA: Straight To The Point and Get 2 The Point. My first project venture was with Grey, a genuine person with a passion for hairdressing and a different perspective: hairdressing for any and all genders and sexualities. Together in 2011, we set up Open Barbers as pop up and cut hair on stage at The Royal Vauxhall Tavern at an event run by Wotever World. Because of it’s popularity, we rented chairs in Chaps and Dames in Finsbury Park. Since then I self - founded Barberette while Open Barbers are now led by Greygory and Felix Lane. In January 2012, I decided it was time to set up my own business, where everyone was welcome, where the approach and the pricing were gender-neutral, and where every client would feel empowered to ask for – and get – what they wanted. I aim to achieve this through the highest standards of professionalism. I teach, mentor, and participate in the community, whether it is LGBT events, arts events, or hairstyling shows and colleges. Hairstyling is more than great hair: it is about how we connect to the world as ourselves, and I and my associates are committed to delivering a new and inclusive approach to visual and style identity. We are members of the Hair Council and the Good Barbers Guide. Barberette engages discussions at national hairdressing organisations and educational establishments to ensure that people of all genders, races and sexualities be made welcome, safe, equal and listened to, side by side in salons and barbershop. We are team of three - Rose, Mako and Klara and looking after a clientèle of over 2000 from our Hackney hub - including well known Hannah B from Gossip, DJ Alinka and actor Peggy Shaw who come by whenever they are in London.